One of the best pumpkin patches I've ever been to was the one in California. I like the fact where you can pick your own pumpkin over there. I guess it's different here in Texas because giant pumpkins won't pollinate successfully in temperatures above 90 degrees. So, I guess that's why most pumpkin patches here are not that really impressive. It's just my opinion. 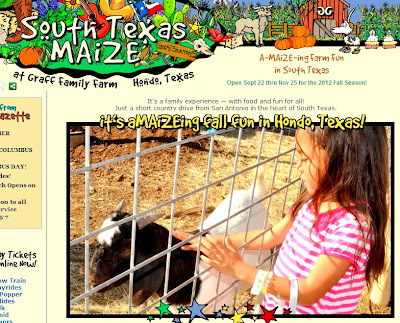 Anyhow, we took our daughter to South Texas Maize last weekend. Honestly, I wasn't too impressed this year. Well, except the 7-acre corn maize. They could have done better. The petting zoo was a joke...lol! Two goats? That's it? What happened to other animals? They could have rented some pigs, ducks, chickens, horses, sheep, or buffalo at PETCO...nyahaha! No pony rides or face painting either. Well, I expected too much. All I can say is we had so much fun last year at South Texas Maize. They even featured our daughter on their website this year.